At first glance, nothing seems particularly odd about the December 1896 edition of The Druggists Circular and Chemical Gazette, a catalog of products that any self-respecting pharmacy ought to carry. But look closer: Hiding among medical necessities like McElroy's glass syringes and Hirsh Frank & Co's lab coats, you’ll find some more curious finds—including Hershey's cocoa powder. "Perfectly soluble,” boasts the ad in bold, capital lettering. “Warranted absolutely pure.” It reads as if it was peddling medicine—and in fact, it sort of was. Druggists of the day often used the dark powder to whip up a syrup sweet enough to mask the flavor of objectionable remedies, explains Stella Parks, a pastry chef with the food and cooking website Serious Eats. Parks happened upon these vintage advertisements while she was researching her new book, BraveTart: Iconic American Desserts, which features lesser-known histories of our favorite sweet treats. The Hershey's ad intrigued her. "What in the world are these guys doing advertising to druggists?" she recalls wondering at the time. 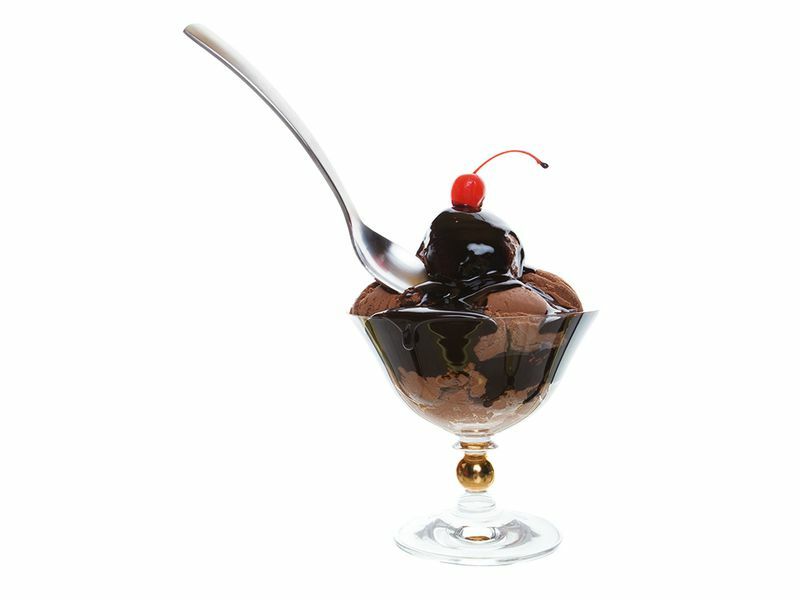 By digging into the history and tracking down more pharmaceutical circulars and magazines, she discover the rich history of chocolate syrup, which began not with ice cream and flavored milk—but with medicine. Our love of chocolate goes back over 3,000 years, with traces of cacao appearing as early as 1500 B.C. in the pots of the Olmecs of Mexico. Yet for most of its early history, it was consumed as a drink made from fermented, roasted, and ground beans. This drink was a far cry from the sweetened, milky stuff we call hot chocolate today: It was rarely sweetened, and likely very bitter. Still, the roughly football-sized pods that cradled the beans were held in high esteem; the Aztecs even traded cacao as currency. Chocolate didn’t become popular overseas, however, until Europeans ventured into the Americas at the end of the 15th century. By the 1700s, the ground beans were avidly consumed throughout Europe and the American colonies as a sweetened, hot drink that was vaguely reminiscent to today’s hot cocoa. At the time, chocolate was touted for its medicinal properties and prescribed as treatment for a range of diseases, says Deanna Pucciarelli, a professor of nutrition and dietetics at Ball State University who researches the medicinal history of chocolate. It was often prescribed for people suffering from wasting disease: The extra calories assisted in weight gain, and the caffeine-like compounds helped perk patients up. "It didn't treat the actual illness, but it treated the symptoms," she explains. Yet for pharmacists, it wasn’t only the supposed health benefits but also the rich, velvety flavor that held such appeal. "One thing about medicines, even going way back, is that they are really bitter," says Diane Wendt, associate curator of the division of medicine and science at Smithsonian's National Museum of American History. Many medications were originally derived from plants and fall in a class of compounds known as alkaloids, which has an acrid, mouth-puckering flavor. The first of these alkaloids, isolated by a German chemist in the early 1800s, was none other than morphine. Chocolate, it turns out, effectively covered the toe-curling taste of these foul flavors. "Few substances are so eagerly taken by children or invalids, and fewer still are better than [chocolate] for masking the taste of bitter or nauseous medicinal substances," according to the 1899 text, The Pharmaceutical Era.